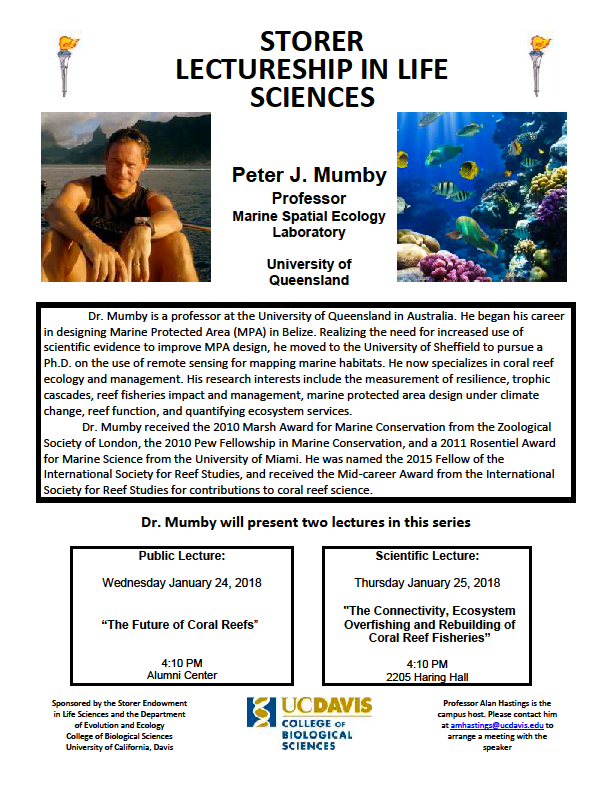 We are pleased to announce that Peter Mumby, Professor of Marine Spatial Ecology Laboratory from the University of Queensland in Australia, will be presenting two lectures in the Storer Lectureship in Life Sciences Series, “The Future of Coral Reefs,” at 4:10 p.m. on Wednesday, January 24, 2018 in the Alumni and Visitors Center and “The Connectivity, Ecosystem Overfishing and Rebuilding of Coral Reef Fisheries” at 4:10pm on Thursday January 25, 2018 in Haring Hall. Please see the attached flyer for additional information. Author Jonathan EisenPosted on January 10, 2018 January 10, 2018 Categories Misc.Tags Misc.